I recently mentioned that I prefer using quotes on my cards rather than simple sentiments, its not always possible, but I truly love having a good quote on a project. 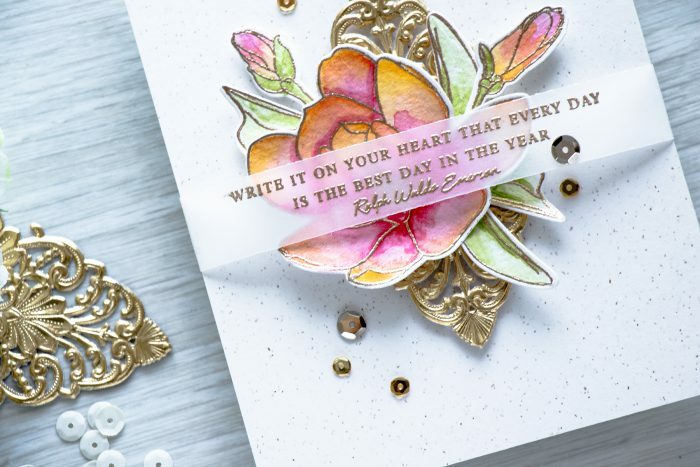 Today I’d like to share 3 cards I created for Altenew to help showcase their new quotes stamp set – Beautiful Quotes. 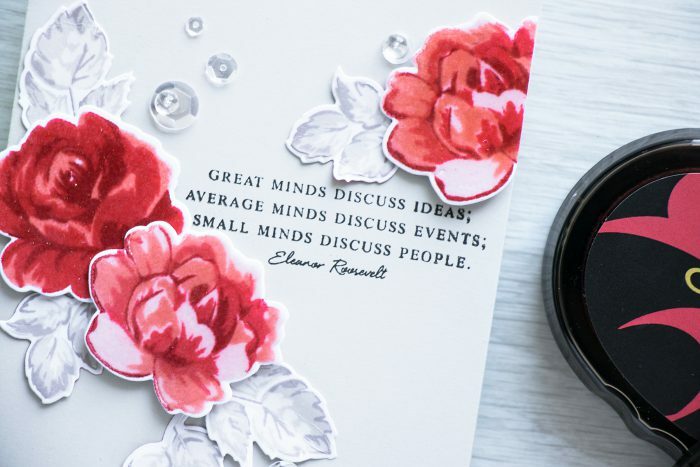 I’m so happy they came out with another set like this (I’ve been asking Tasnim, the co-owner, to do another quote set), I’ve been a huge fan of Sentiments & Quotes and now I have more options to choose from. I first created roses and leaves using images from the Vintage Flowers stamp set. I am always inspired by Aga’s creative use of color and fascinated by how she manages to use the most unexpected colors for the leaves. I used Altenew’s Grays to stamp the leaves and Reds to stamp the roses. 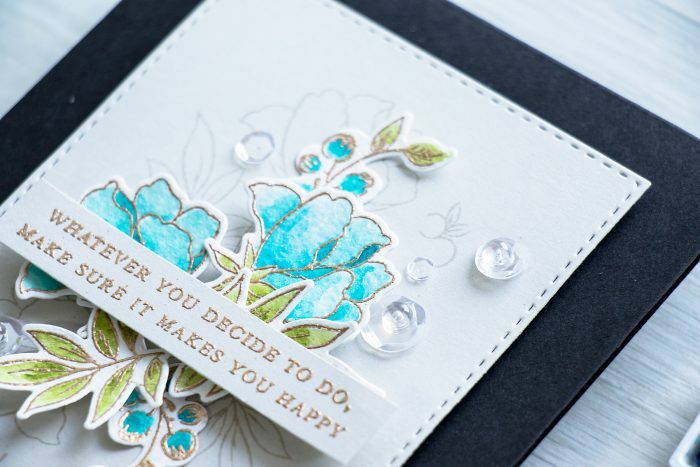 I also added a layer of clear embossing powder over the flowers to make the colors more intense. The sentiment was stamped in black ink directly onto a light gray card base. The quote on my next project makes up for a fantastic encouragement card. I added watercolored flowers and leaves and went with my favorite teal and green color combination. I used images from the Peony Bouquet set and heat embossed them in gold onto watercolor paper. Identical design was stamped onto the background panel using light gray ink. For the last project I went with my favorite layout for a card, I also used the same technique shared here where I colored the images outside the lines. 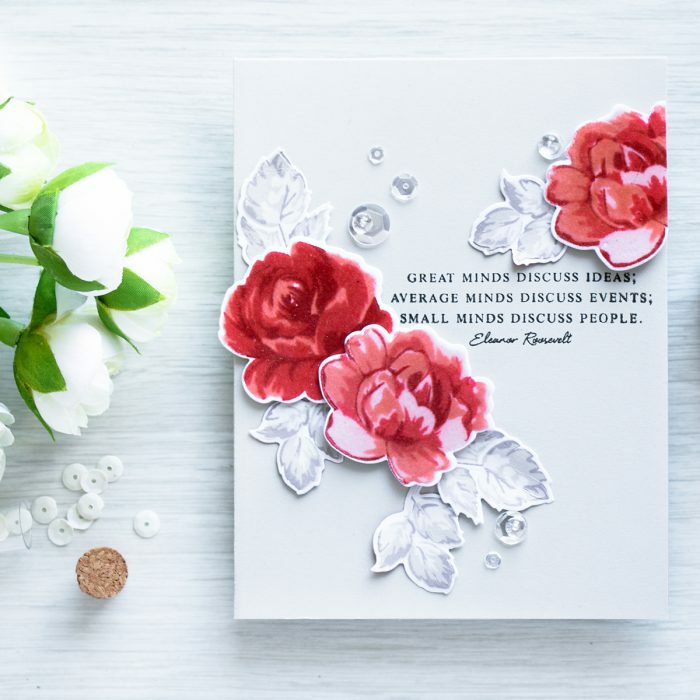 The quote was heat embossed onto vellum and was wrapped around the front the of the card. 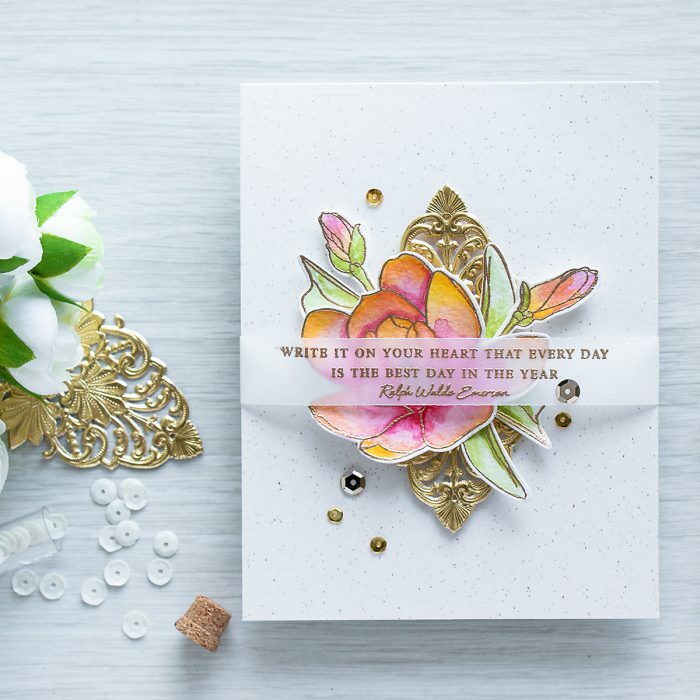 Flowers and leaves came from Magnolias for Her set and were also heat embossed in gold, watercolored and die cut using matching dies. Your cards are gorgeous! Love the elegant look, bright flowers look incredible on crisp white background! thank you so much, Svitlana! Beautiful cards Yana and I love the quotes. 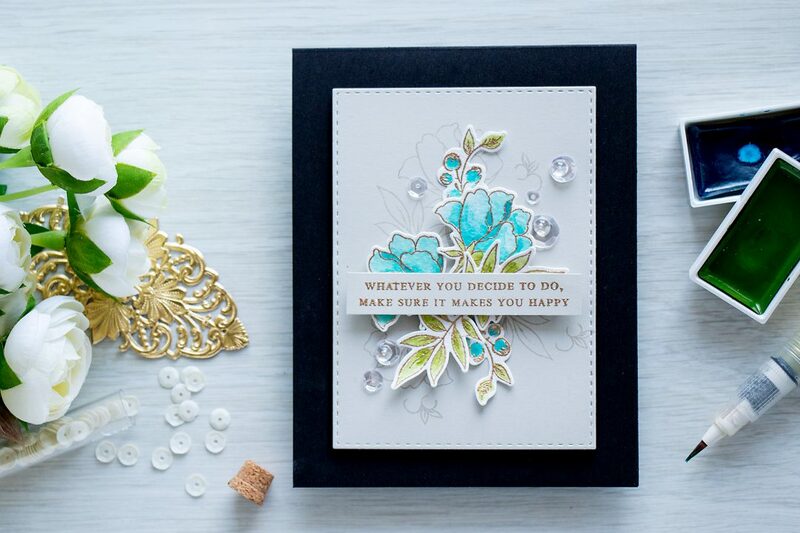 Yana, your floral cards are spectacular!! I love the idea of using clear embossing powder over the inked image to make the color more intense!! Thanks for sharing!! thank you so much, Teresa! I’m a bit addicted to that clear embossing trick. Very gorgeous card Yana ! So elegant ! And the quotes are so true. Thanks for sharing. 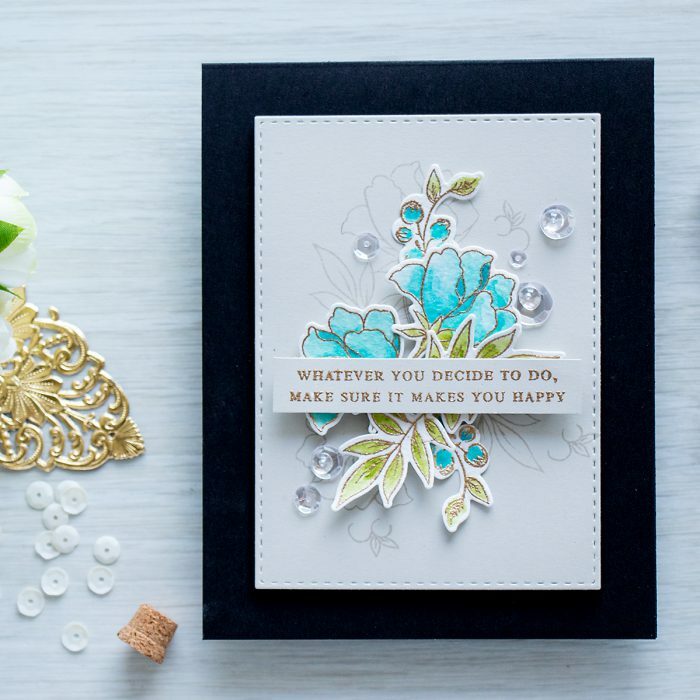 Yana, your card creations are always so elegant and beautiful. I wish I lived nearby you so that I could learn from you directly. You’re the best. And, thank you for sharing your talent with all of us.